How to Cast DVD Movie to TV with Chromecast? Using Google Chromecast means an easier way to cast all your favorite entertainments and apps to bigger TV from smartphone, tablet or laptop. Partial its charm relies on the powerful streaming ability, what makes Chromecast remain hot since the listing is the tough to beat price $35. Even if you rarely use the streamer, you would get a good value for the money. 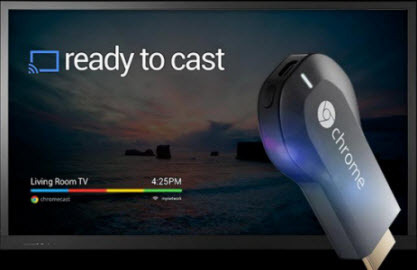 Google Chromecast is a thum-sized media streaming device to plug into HDMI port on TV to cast video, music and photo to HDTV from your smartphone and tablet. What’s more, this tiny sticker is work well with a growing number of apps, like Netflix, HBO GO, YouTube, WatchESPN and Pandora. And Google claimed that it will keep regular update for the popular dongles. For everything else, you can mirror all websites in Chrome to TV with Chromecast. However, is it all impeccable for Chromecast streamer? No, of course not. For there is no TV-based user interface, you must always keep smartphone or tablet at hand to unlock and handle when you want to pause and restart the streaming. The great Wi-Fi network is the necessary guarantee for free-flowing streaming process, which is less-than-ideal for hotel when you are in traveling. Moreover, it is not available to cast DVD movies to bigger TV via Chromecast media mirror, unless DVDSmith Movie Cloner & Ripper Software does a favor. Besides not able to cast DVD movies to bigger TV, Chromecast also cannot stream iTunes DRM-ed M4V videos to TV. iTunes videos are tightly portected by Apple FairPlay DRM, which restricts them from playing on non-Apple devices. To cast iTunes M4V videos to Chromecast, you can seek help from Noteburner M4V Converter Plus. Noteburner M4V Converter Plus (For Winodws / For Mac) is a professional iTunes movie to Chromecast which can help you remove DRM protection and convert iTunes movies and TV shows losslessly to Chromecast supported normal MP4 format in 30X faster speed with AC3 dolby 5.1 surround audio and Closed Captions/subtitles preserved. You can refer to this tutorial for help: How to Cast iTunes Movies/TV Shows to Chromecast. This DVD Movie Converter is compatible with Windows 8/7/Vista/XP, supporting you to rip movie DVDs to videos in common formats, like MP4 supported by Chromecast. 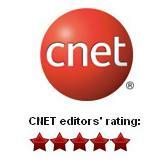 Tip: For Mac OS users, including Yosemite, Mavericks, Mountain Lion, Lion and Snow Leopard, freely try the Mac version from here. Double click to start the movie ripper and insert a movie DVD disc into your DVD driver. Click "Open DVD" and then the software will recognize the longest title automatically. 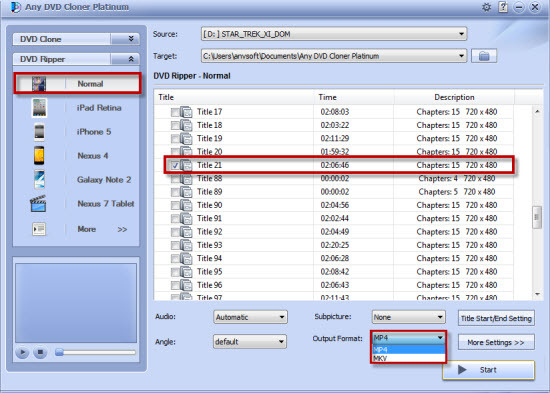 Move to "DVD Ripper" and click "Normal" mode, supporting you to rip DVD movie to video in MP4 and MKV formats. It is highly recommended to choose "MP4" in the drop-down list of "Output Format", which is compatible with Chromecast and can preserve the original movie quality mostly. Click "Start" button on the low right corner of the main interface to begin the process of ripping DVD to video for casting to HDTV with Chromecast. There is a progress bar to let you check. Get it in "Target" after the ripping is finished. Following the above easy 4 steps, Any DVD Movie Ripper Software lets you not only access to online channels, like Netflix, HBO GO, YouTube, WatchESPN and Pandora, but also mirror all collected movie DVD discs to bigger TV with Google Chromecast. * Which One is Better? Google Nexus 9 or Nexus 7? * How to Rip DVD Movies to iPad Air 2? And iPhone 6/6 Plus?